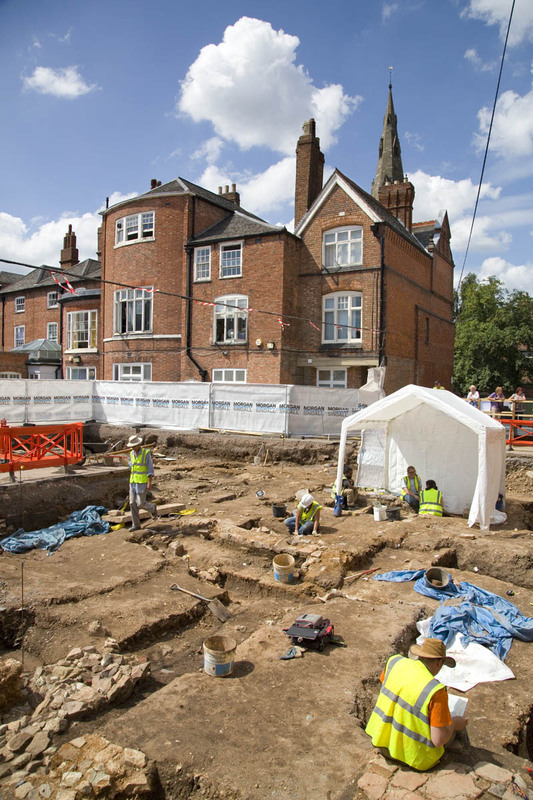 The discovery of the lost friary of Grey Friars and the remains of King Richard III in 2012 was by no means the end of the Grey Friars Project. In July 2013, archaeologists returned to the site to carry out a second, month-long excavation as part of the site’s ongoing interpretation as a heritage asset. The continued investigation of the area around Richard III’s grave aimed to provide further information concerning the relationship of the grave within the friary church and a better understanding of the development of the friary itself. This would aid the development of the visitor centre on the site and would protect any archaeology threatened by the new build, either through excavation or the development of an appropriate mitigating scheme. Work was carried out in partnership between the University of Leicester, Leicester City Council and Morgan Sindall, the council’s contractors for the visitor centre. 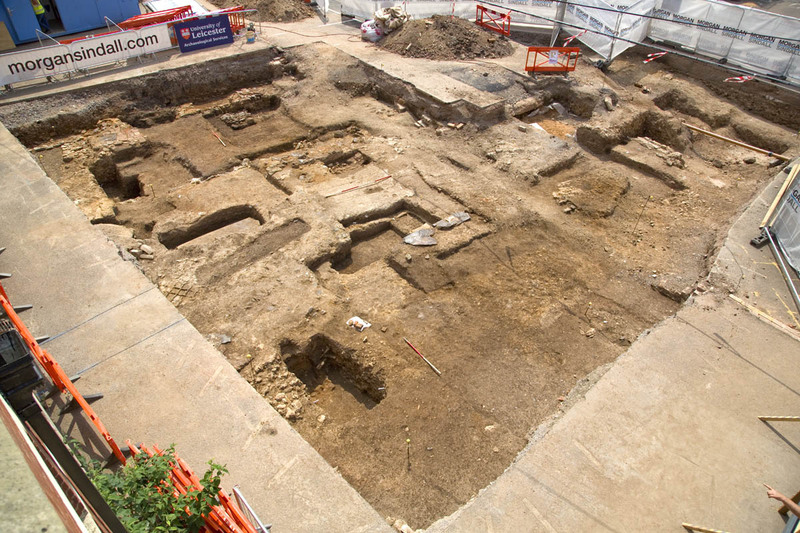 A 25m by 17m area around the grave site was excavated to uncover as much of the eastern half of the Grey Friars church as practicable. This again lay partially within the car park and former playground previously excavated. Valuable new information for the chancel of the Grey Friars church has been uncovered. Wall lines have been confirmed and a more precise orientation for the building has been established, whilst newly discovered structural details such as buttresses and fragments of architectural stonework are important clues which will aid archaeologists in piecing together what the church would have looked like. Finding the first evidence for the northern choir stall and importantly the choir’s western end gives a better idea of how the church was laid out and confirms that Richard III’s grave is indeed at the western end of the choir close to the southern choir stall. 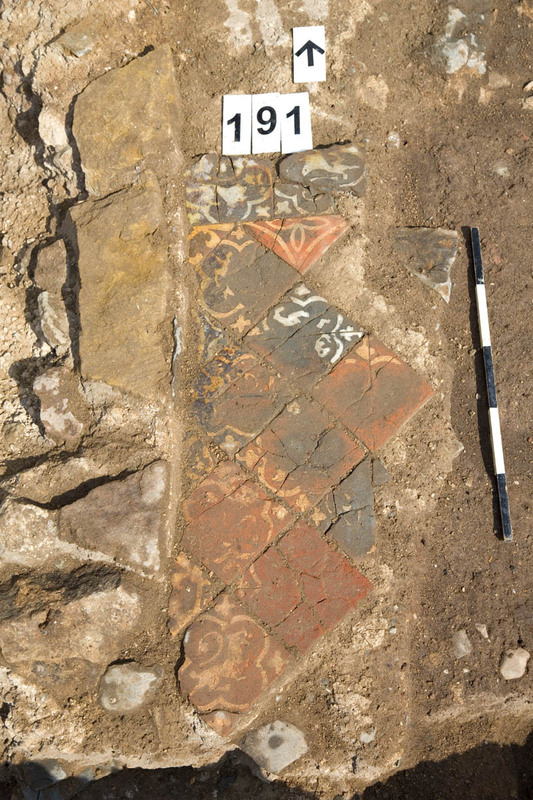 The discovery of the first piece of intact tile flooring inside the choir, coupled with tile impressions elsewhere will allow archaeologists to reconstruct the floor pattern inside parts of the church. 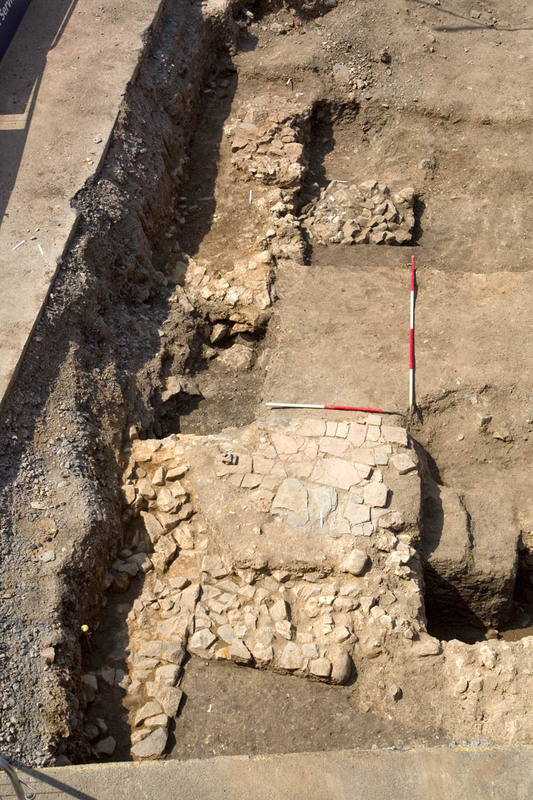 Archaeologists also discovered that no evidence of the church survived on the eastern side of the excavation (where they were hoping to find the church’s nave). This was because the ground had been extensively disturbed, perhaps by Tudor workmen ripping out the massive foundations of a church tower when they were demolishing the church in the mid-16th century. 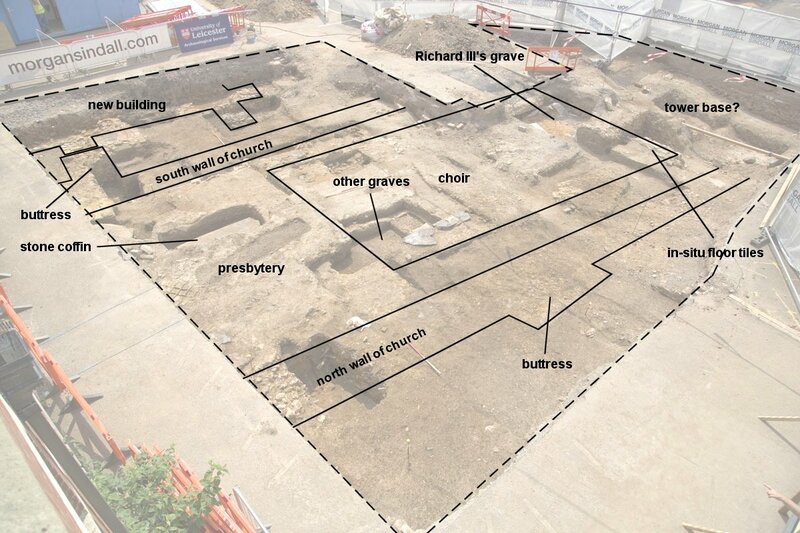 This missed Richard III’s grave by centimetres! Another important find was the discovery of a substantial stone building with large buttressed foundations, immediately south of the church and seemingly not joined to the other cloistral buildings to the west. This is a significant addition to the site’s history. One possibility is that it could be the remains of an earlier church or chapel on the site. Tantalisingly, new historic research has identified two references to the construction of the church. The first in AD 1255 references the completion of the friar’s chapel, whilst the second in AD 1290 refers to the completion of the church’s nave and north aisle. This could be interpreted two ways: one, that the friars first built the chancel of the church (the ‘chapel’) before adding a nave; or two, the friars built a separate small chapel for their own use before replacing it with a larger church. As part of the 2013 excavation, three more graves inside the church have been excavated – one from the presbytery, one from the eastern end of the choir and one half under the choir and half under the presbytery so presumably from an earlier phase of the church. These provide valuable comparative data which will help provide further important insights into the manner of Richard III’s burial. A further seven graves have also been tentatively identified in the chancel of the church. These have been left intact and undisturbed. Elsewhere on site further evidence for the friary’s demolition during the Dissolution of the Monasteries in the mid-16th century has been recorded, as well as evidence of the site’s use as a garden in the post-medieval period, including another section of tile pavement, thought to be one of the Herrick family’s garden paths. Henry III ‘s Family members buried at Grey Friars. His wife Eleanor’s herart. His daughter, Beatrice of England, my great…grandmother. Edward I, his son’s wife. Edward II wife, his grandson’s wife too. This is true, Henry III’s queen Eleanor of Provence (d.1291) was buried in the abbey at Amesbury but her heart was returned to London where it was buried in Greyfriars. Their daughter, Beatrice (d. 1275), who predeceased Eleanor, had also been buried in the friary church and this seems to have triggered a small family tradition. Edward I’s second wife Margaret of France (d.1318) was an important patron of the friary and was also buried there, as was Isabella of France (d.1358), Edward II’s wife, and one of her daughters Joan (d.1362). Greyfriars was one of London’s largest medieval churches, it survived the dissolution of the friary in 1538 eventually becoming the church for the parish of Christ Church until it was destroyed during the Great Fire of London in 1666.